Name : Vote if you hate J.B. Attack 1 : NO JUSTIN B. VOTE FIVE STARS IF YOU HATE HIM!!!!!!!!!!!!!!!!!!!! Flip a coin. 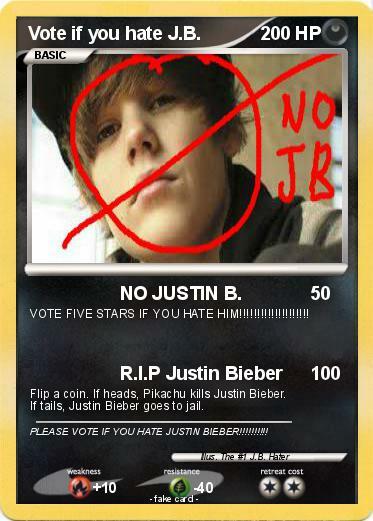 If heads, Pikachu kills Justin Bieber. If tails, Justin Bieber goes to jail. Comments : PLEASE VOTE IF YOU HATE JUSTIN BIEBER!!!!!!!!! !